Microsoft has adjusted her licensing policy once again regarding the availability of Windows Server 2012 R2 in combination with virtualization and cloud environments. I get a lot of questions regarding how to handle licensing Windows on VMware. Licensing of Windows server products with virtualization technologies and specifically with VMware vSphere Clusters is a challenge. 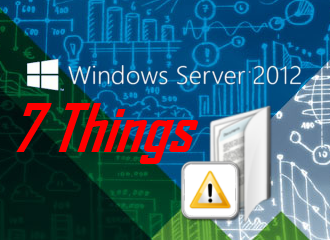 Therefor I compiled a top 7: Things you should know regarding the licensing of Windows 2012R2 in a VMware environment. Even when using Microsoft Windows Datacenter licenses you still need CALs! Windows Server 2012 and Windows Server 2012R2 are licensed under the Processor/Client Access License (CAL) model. In addition of the Windows Server 2012 License you also need a Windows Server Client Access License also called CAL. This is required for each user or device (or combination of both) that accesses or uses the Windows 2012 software. You have to license every processor on the server! To run an instance of Windows Server software on your server, you must license every processor on the server. Each Windows Server license covers up to two physical processors on a single server. The number of instances you may run depends on the Windows Server edition license that is assigned. You may make any number of copies of the software. You may store copies of the software on any of your servers or storage media without the requirement of additional Windows Server licenses. The only difference between these two editions are the virtualization rights. Windows Server 2012 Standard edition entitles you to run one instance in the physical Operating System Environment (OSE) and two instances in the virtual OSE. (For explanation of OSE see this link) You get entitled to unlimited number of VMs on up to two physical processors per server when using the Windows Server 2012R2 Datacenter edition. There is also an Essentials and Foundation edition but those are not used in business environments or your business should have no more than 25 users which in that case maybe Essentials is an option. Foundation does not have any virtualization rights. In volume licensing you can only get Datacenter and Standard. When using Windows Server 2012 Standard edition licenses you are permitted to use two virtual VMs on that server. If you need licenses for five or six VMs on that server you may assign three Standard edition licenses to that physical server. If you go beyond seven VMs per server it is wiser to use Windows Server 2012R2 Datacenter edition and switch to unlimited VMs. Microsoft made a change to the licensing of Windows Server to align Windows Server 2012, System Center 2012 and the Core Infrastructure Server (CIS) licensing all with one consistent model creating alignment across Microsoft infrastructure products. Microsoft reckons to have a single-licensing model will make it easier for you to buy the right product for your needs and to compare the cost of alternatives. The new licensing model should make it easier to track licensing and therefor reducing management overhead. You are not required that the server has two physical processors, you may assign the licenses to a server with one physical processor. However you may not split the license across multiple servers and assign it to another server with one physical processor. Also you do not assign the license to a VM but to the physical server it runs on. On the other hand would you ever do that? Because Datacenter gives you unlimited VM virtualization rights. But you could have the situation that you have some standard licenses assigned to an ESX server and you are moving to Datacenter. Make sure you detach the Standard licensing first before assigning the Datacenter license. Otherwise you are braking the terms of the licensing. PUR – Product Use Rights MicrosoftProductUseRights(WW)(English)(April2014)(CR) for volume licensing or End User License Agreement for other editions/channels. If I have a Server 2012 Datacenter VM server, and need to host a Server 2012 R2 VM, can I do that? Would I just need a Server 2012 R2 Standard license?